Eggnog is by far my favorite holiday treat. I always splurge on a bottle of this amazing, local family farm produced eggnog from Broguiere’s. This stuff is so beloved and popular that in the past, people have gone around buying up all the inventory to sell on eBay! This year, I wanted to make a “Christmas morning” type recipe that incorporated the eggnog. 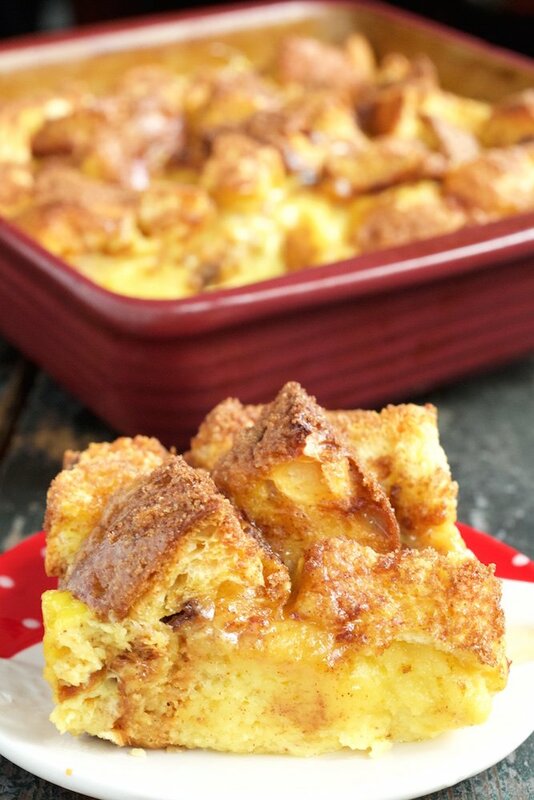 I chose to go with a classic french toast bake. If you’ve ever made an overnight breakfast casserole, you know that you just really can’t go wrong with them. The bread has all night to soak in the goodness of the marinade, which in this case is the sweet creamy eggnog, along with some other goodness. Speaking of bread, I decided the traditional french loaf just wouldn’t do. Panettone is a sweet bread that is a very popular Christmas treat in many parts of the world. It involves candied oranges and raisins, which I thought would taste fantastic with the eggnog. I didn’t want the flavor of the panettone be overwhelming, so I also used brioche. My grocery store sells loaves of brioche, but if yours doesn’t I think croissants would be a great substitute. 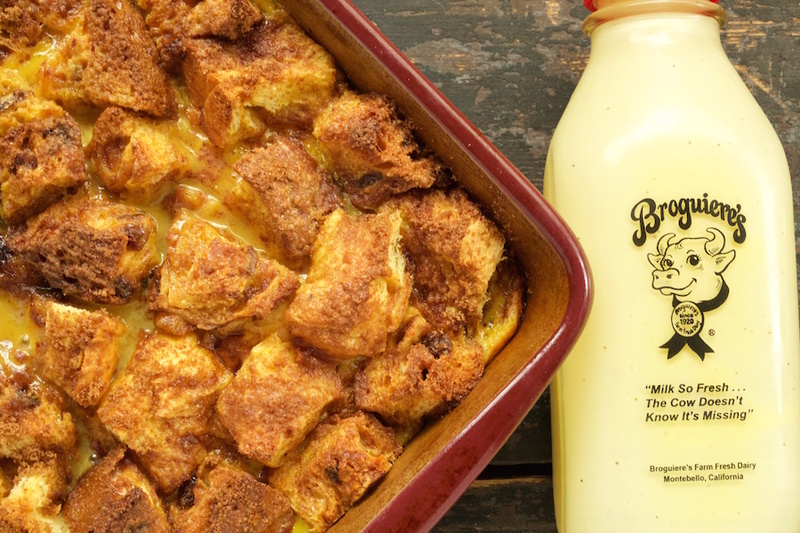 I hope you enjoy this eggnog french toast bake. I think it is going to become my Christmas morning tradition! Cut Panettone and Brioche into 1/2″ cubes. Place cut bread into a greased 9×9 baking dish. In a large bowl, add the eggs, eggnog, sugar, nutmeg, cinnamon, salt, and vanilla. Whisk together until thoroughly combined. Pour eggnog mixture evenly over the Panettone and Brioche. Cover and refrigerate overnight, up to 12 hours. When ready to bake, preheat the oven to 350°. 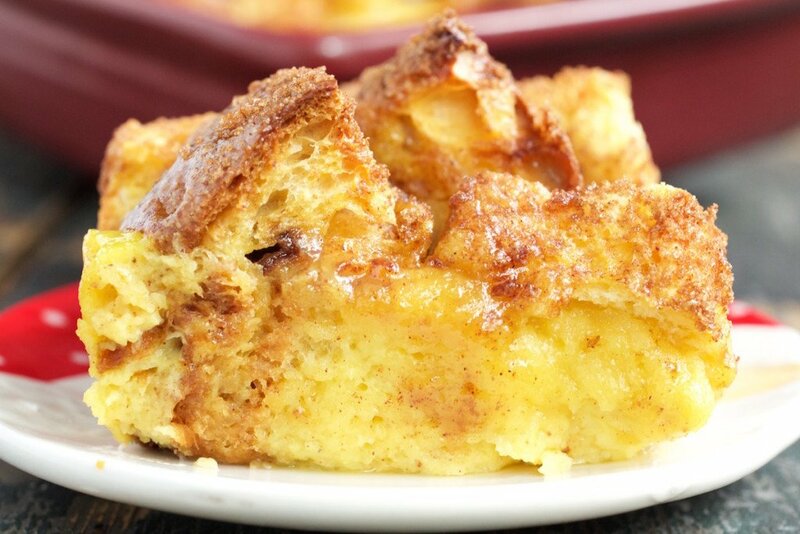 Uncover french toast and sprinkle brown sugar cinnamon mixture over the top.